Our consciousness perceives objects, events and phenomena in existence. Thoughts and emotions feedback, as internal manifestations of consciousness, to process information stimulus from our environment. Our thoughts and emotions unite to produce our actions. We output a response as action or behavior, the external manifestation of consciousness. To be united in consciousness requires that we think, feel and act in harmony, alignment and integrity among our own manifestations of consciousness. Blue represents internal or receptive/passive and therefore feminine. Red represents external or active and therefore masculine. Green represents the unification or activated states, such as from uniting the internal blue and external – red to make green. I’ve used blue, red and green before, based on the frequencies of light, where red is the lowest and blue is the highest, while green is in the middle. This is used to symbolize certain meaning through color which helps in our imagery and understanding of concepts. Speech/words are external actions of internal thought. Thoughts are where it all starts. Since thoughts are first, they are the first active and also generative state within us. Thoughts are also part of our internal unseen realm that is unique to each individual. This is why thoughts are red because they’re active, they are internal which makes them blue, and they are the first generative and manifestation essence within ourselves which makes them green. 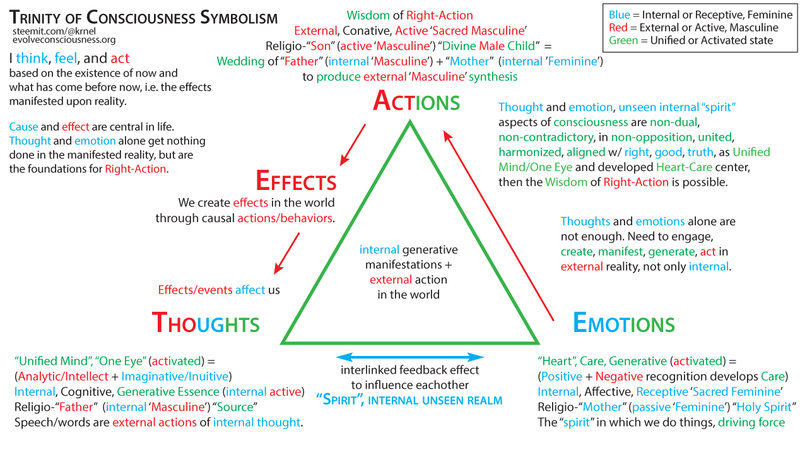 When our thoughts are not contradictory, when we have integrated a coherent and cohesive understanding of reality, when our “left” (red) and “right” (blue) brained modalities of consciousness are not in opposition, but are harmonized in unison (green), then we have the symbolism of a “unified mind” or “one eye” present for that particular task or function we are engaged in at the time. We could be unified at one moment, yet divided another. The green “unified mind” or “one eye” symbolism is an activated state, formed through a synthesis of our analytical and intellectual left-brain capacities, holistically integrated with our imaginative and intuitive right-brain capacities. Thoughts are our internal cognition, the generative essence that starts everything. As such, it is both internal, but also active in that it is the active generative essence and force that gets the ball rolling. Since this is the activated and therefore masculine symbolism, this relates to the religious symbolism of a source generative essence for creating, represented as the father or male figure. This is “God” in the Christian Trinity. We, consciousness, are the “gods” that affect, manifest, generate and create into reality. We are all creators, and symbolism is used to represent who we are. This deep self-knowledge is lost over time as people interpret symbolism, metaphor, allegory, analogy, and parable as literal. Even before we get to physical action with our hands to create things in the world, like our source generative essence is capable of doing, we are able to express our internal thoughts through speech and words which are external actions. As mentioned, the thoughts are part of our internal unseen realm within consciousness that can be symbolically referred to as the “spirit”. I’ve done some work on the etymology of the word “spirit”, what it was created to reference, and how we reference it ourselves. The 2 demonstrable definitions I derived are that of first being a reference to consciousness, psyche, “soul”, “spirit” and self as meaning the same thing, while the other secondary meaning that we use refers to goodness or morality. The other component in the internal unseen realm of manifesting consciousness, is our emotions. In this internal unseen realm, represented through the color blue, we have a feedback process between our thoughts and emotions before we engage in the external manifestation of consciousness, which is represented through our actions and behavior, which includes speech/writing. Emotions are in blue because they are part of the internal manifestations of consciousness, but also because they are receptive or passive and represented by the feminine. Emotions are also symbolized through the word “heart” which is used as a reference due to its location within the middle of our body. As I mentioned before, green being the middle between blue and red, where our emotions, desires and what we care to do, good or bad, will generate a driving force within us that motivates us and eventually leads us to act. In the Trinity of Consciousness as well, emotions are in the middle between thoughts and actions, so they aptly fit the green color. To be in the “heart”, to have truer care and generate in an activated holistic capacity, means we have both the recognition of the positive and negative within ourselves and the world, which will develop our true care and concern for what is going on, leading to our motivation to learn more truth, so that we can empower ourselves to be in and position of understanding, to act in wisdom. Emotions are internal, yet are affective instead of cognitive despite requiring cognition in order to apply meaning and valuation as an emotion. Thoughts and emotions are part of a properly functioning consciousness. But emotions are the aspect that affect us the most, which is why the study of emotions is called the affective sciences, while the study of our thoughts is part of the cognitive sciences. Tying this back to the religious Trinity, the internal passive feminine is the religious mother figure which contrasts the internal active masculine of the religious father figure. This is represented as the “Holy Spirit” in the Christian Trinity. I mentioned briefly the etymological and demonstrable definition of “spirit” as being the internal, unseen, formless, nonphysical, metaphysical motivational generative essence of our consciousness itself. And our purpose to be more “spiritual”, is to be more moral. I can get more into this another time to explain it more. Our emotions, act as the “Holy Spirit” which moves us to do things as the driving motivational force in our lives. Our saliency towards the importance of things is how we value them which requires emotions to be involved. Thoughts and Emotions alone are not enough. Need to engage, create, manifest, generate, act in external reality, not only internal. Thought and emotion, unseen internal “spirit” aspects of consciousness are non-dual, non-contradictory, in non-opposition, united, harmonized, aligned w/ right, good, truth, as Unified Mind/One Eye and developed Heart-Care center, then the Wisdom of Right-Action is possible. Thoughts and emotions alone are not enough to get things done. We need to engage, create manifest generate and act in the external objective reality not only our internal subjective reality. Thoughts and emotions are the internal, unseen, hidden “spirit” aspects of consciousness. When they are unified in harmony, non-dual, non-contradictory and not in opposition and are aligned with what is right, good and true, as a truly “unified mind” and “one eye”, with a developed “heart-care” center, then we are capable of engaging in the wisdom of right-action. Actions can be good or evil, and even contain qualities of both. We must be able to discern right from wrong more effectively as our lives progress. Actions are the culmination, unification and synthesis of our internal expressions of consciousness (thoughts and emotions), as an external expression of consciousness (actions). What we do with what we know is how we get things done in the world. First we are being internally, and then we are doing externally. The goal of philosophy is about arriving at the wisdom of right-action. Philosophy means the love of wisdom. Wisdom has an internal component in being wise in understanding, in your being, but the more important wisdom is when you actually act and engage in that understanding by creating into the world based on it. The purpose for all humans is to evolve consciousness towards greater wisdom of right-action. Actions are external, and symbolically represent the active sacred masculine, the counterpart to the receptive or passive sacred feminine. Actions are conative in terms of the scientific description as a trinity of the cognitive, affective and conative theory of mind. In the Christian Trinity, and other Trinity’s involving a father and mother that produce a divine male offspring, there is Jesus as the “son of God”. “God” was the internal active masculine symbolism to represent ourselves, while the “son of God” is the external active masculine representation of ourselves. The divine male child, is masculine and red, but also green, because actions are a generative force in the external world, as well as a unification of a man and woman to produce a child which is also a generative process. The alchemical wedding of the father (the internal masculine qualities of consciousness), and the mother (the internal feminine qualities of consciousness), harmonize and unite to produce an external masculine synthesis. This Trinity symbolism is found in many ancient stories, legends and mythologies. The holy trinity symbolic representation is found in many literary works or artistic representations from Sumeria, Babylonia, India, Greece, Egypt, Germany, Nordic lands, and more. The trinity symbolism was used in many ways to represent different understandings. Esoteric knowledge is hidden under exoteric stories, and people forget about the original hidden meanings, where they then take the colorful exoteric story as literal reality instead. We create effects in the world through causal actions/behaviors. Our actions produce effects into the world. We are all manifesting, generating and creating into reality. All of us together collectively co-create the human world around us. As we all act and create effects and events, the world around us moves, and in turn we are affected by what happens in reality. The green triangle represents consciousness, psyche, “soul”, “spirit”, self, the fifth element quintessence. As our internal generative manifestations are united and create a unified external action in the world, so too are we then engaging in a unity consciousness where our thoughts, emotions and actions do not contradict. I think, feel, and act based on the existence of now and what has come before now, i.e. the effects manifested upon reality. Cause and effect are central. Thought and emotion alone get nothing done in the manifested reality, but are the foundations for Right-Action. We are to think, feel and act in unison within ourselves internally, and not be in internal opposition or conflict. But we must also think, feel and act based on the existence of what is currently in reality and what has come before. The present is created from the past, and leads us into the future. Cause-and-effect are central in life. Thoughts and emotions alone get nothing done in the manifested reality, although they are the axiomatic causal foundations that establish and motivate our actions in the world. If we want to engage in right-action, we have to understand and care to know right from wrong, truth from falsity, in order to have the wisdom to engage in right-action.